Configurations are modular images that allow you to quickly specify what needs to be installed and configured on computers during imaging. Unlike standard images, you can easily make changes to configurations without rebuilding them. You can manage configurations using Jamf Admin or Jamf Pro. 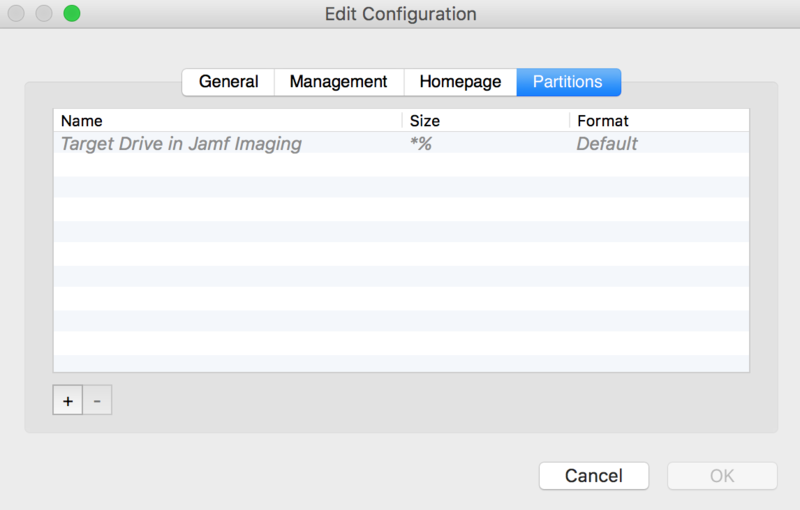 When you create, edit, or delete a configuration in Jamf Admin, the changes are reflected in Jamf Pro, and vice versa. There are two types of configurations: standard configurations and smart configurations. 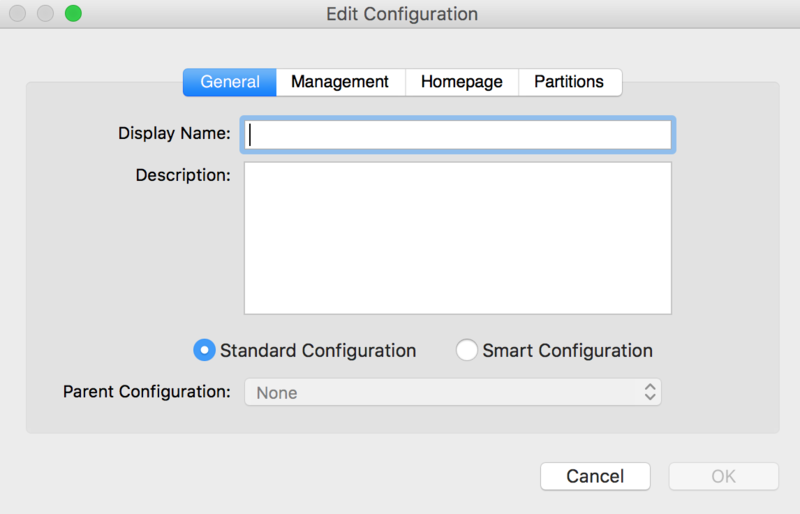 Smart configurations inherit settings from another configuration (called a “parent configuration”). Making changes to the parent configuration automatically updates the smart configuration to reflect the changes. If there are settings in the parent configuration that you want to override, you can customize the packages, scripts, printers, or directory bindings in the smart configuration as needed. You can compile both standard and smart configurations. Compiling a configuration builds a single DMG, allowing you to block-copy the entire configuration during imaging and speed up the process. You can choose to make the DMG a compressed or uncompressed file. Configurations can only be compiled using Jamf Admin. You can only compile configurations if your master distribution point is a file share distribution point. Configurations that include a macOS Installer must be compiled on a computer with the same OS version as the installer. Restore partitions are hidden partitions that have only an OS package and Jamf Imaging installed. They allow you to re-image computers without using NetBoot or an external drive. Note: As a safety mechanism, drives that already have visible partitions cannot be re-partitioned using Jamf Pro. Several settings in Jamf Admin have tool tips. To read more about a specific setting, hover your mouse over it until a tool tip is displayed. Use the General pane to configure basic settings for the configuration. To create a smart configuration, select the Smart Configuration option and choose a parent configuration. (Optional) Click the Management tab and set or create a management account. This ensures that computers imaged with the configuration are managed. (Optional) Click the Homepage tab and enter a homepage URL. 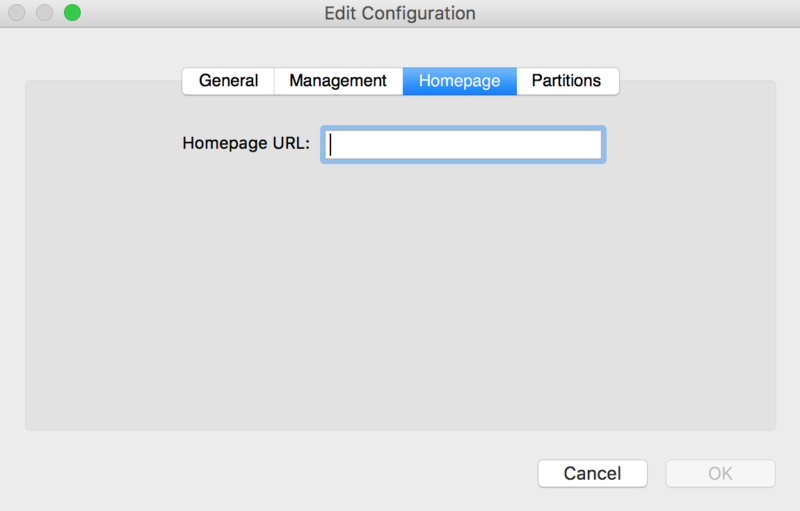 (Optional) Click the Partitions tab and click Add (+) to set up a partition. The configuration is added to the list of configurations in the sidebar. Add packages, scripts, printers, and directory bindings by dragging them from the main repository to the configuration in the sidebar. In the “Computer Management” section, click Configurations . Use the General payload to configure basic settings for the configuration. To create a smart configuration, choose "Smart" from the Type pop-up menu and choose a parent configuration. Use the Packages, Scripts, Printers, and Directory Bindings payloads to add items to the configuration. 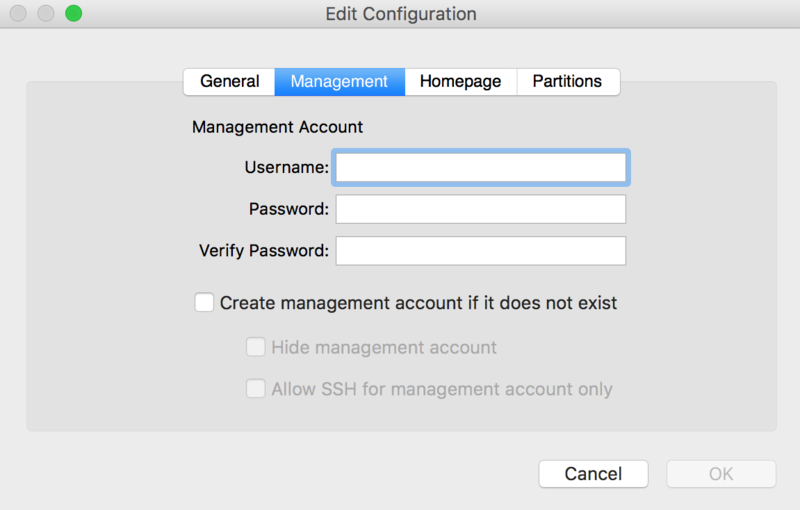 (Optional) Use the Management payload to set or create a management account. (Optional) Use the Homepage payload to set the homepage. (Optional) Use the Partitions payload to set up partitions. The time it takes to compile a configuration depends on the amount of data in the configuration. For fastest results, use a wired connection. You may be prompted to authenticate several times during the compilation process. Note: If you compile a configuration that includes a package with an architecture type requirement and a substitute package, the package substitution will not work. In the sidebar, select the configuration and click Compile. Choose to create a compressed or an uncompressed DMG. Enter credentials for a local administrator account. In the sidebar, select the configuration you want to edit or delete. To edit the configuration, double-click it and make changes as needed. Then click OK.
To delete the configuration, click Delete and then click Delete again to confirm. Find out how to image computers using a configuration and standard imaging. Find out how to image computers using a configuration and Autorun imaging. Find out how to image computers using a configuration and Imaging PreStage. Find out how to image computers using a configuration and Target Mode Imaging. Find out how to create a Winclone image that you can install on a partition during imaging.